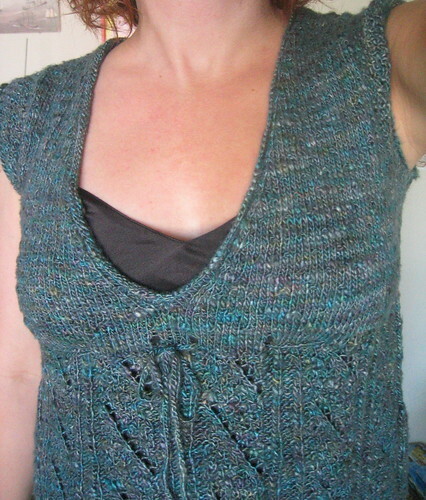 Earlier this summer Jenny knit Molly Ringwald and I got a bad case of sweater envy. On an excursion to Imagiknit, I saw that they had Silky Wool on sale. I bought enough to make Miss Molly, swatched it, discussed it with Jenny, then suddenly without warning I saw Alison's Josephine and all my attention turned in another direction. I had 5 skeins of Artfibers Chai burning a hole in my stash for over two years. This poor lot of grey-green-blue silk had several intended lives. I had purchased it to make some version of Jane Ellison's Butterfly (although I now can't imagine that I would have had nearly enough, as I have about 5 grams left). 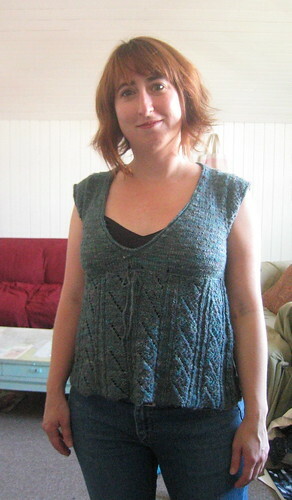 Eventually it was going to become Annie Modesitt's Corset Tank Top. I swatched for both of these projects and the Chai just never spoke to the pattern. This time, this time it was yarn + pattern love at first swatch. Most notably the type of yarn. Instead of a smooth cotton, I used a slubby silk. I made more decreases in order to get the top closer to my bust size. I reduced 4 stitches on row one of each repeat for repeats 2-4. I also decreased as written and did a few more decreases on the last few rounds. My row gauge was tighter than the pattern so I needed to add some short rows to the sleeves to make them long enough to qualify as sleeves. I reduced the bust to have negative ease to account for silk eventually stretching. 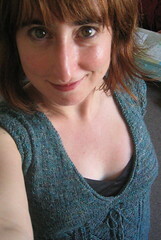 For the same reason I also shorted the armholes. I am happier than I look in that photo. I love this top!